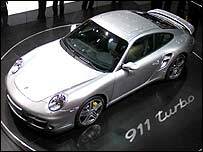 German car maker Porsche unveiled its most powerful 911 sports car yet this week, along with financial figures which show the company's financial performance is equally frisky. The sixth-generation 911, which with its 3.6 litre engine delivers 480bhp, is set to go on sale in June for 115,000 euros ($138,000; £79,000). If current trends are anything to go by, the new flagship will be met with approval. Sales reached a record of 88,379 vehicles in the previous financial year, and Porsche now believes sales will beat 90,000 this year. With net profits up 14.5% to 170m euros in the first half of the financial year, the company's share price is also marking records of some 700 euros. Analysts say the sales growth could go on for years. "Porsche believes it can continue to grow sales right up to the launch of the Panamera in 2009," said Merrill Lynch automotive analyst Stephen Reitman, looking ahead to the anticipated arrival of a four-door, four-seat Porsche. Mr Reitman believes Porsche should be perfectly able to outperform other European car makers, thanks to its "superior margins, earnings growth, impressive cash flow and return on capital expenditure". "Porsche is successively managing the transition to its new range of sports cars, while the Cayenne SUV continues to provide strong earnings momentum," he says. Porsche's traditional strength, the sports car, remains at the heart of its success. The sports cars include not just the spruced-up 911 and its racing colleague the 91 GT3, which are both on display at the Geneva motor show, but also its cheaper Cayman coupe and Boxster convertible. And for the moment, it seems drivers just cannot get enough of them. But things have been a little tougher for their bigger cousin. But in recent months, sales have been slipping as customers have turned away from large 4x4 cars. "SUV numbers are not what they used to be," acknowledges Porsche spokesman Michael Baumann. "But the luxury SUV market, the niche that we're playing in, is not as affected." Cayenne production fell 6% last year, but Mr Baumann says Porsche preferred to cut output rather than offer discounts that could devalue its brand. And with new Cayenne models that include the just-launched Turbo S - the most powerful SUV in the world - and a petrol-electric hybrid in the pipeline, Mr Baumann says a turnaround is just around the corner. Mr Reitman agrees. "This should enable sales to increase again," he says. 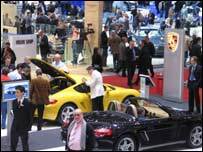 But factors beyond Porsche's control could hurt its earnings, Mr Reitman warns. One major risk would be a further weakening of the US dollar - as happened in the 1990s, when it came close to pricing Porsche out of the US market, as Mr Baumann acknowledges. "So these days we have a very conservative hedging policy," he says. "We're fully hedged three years out. The dollar does not concern us in the mid-term because of that policy." Porsche is also set to gain from its 18.53% stake in Volkswagen Group, acquired late last summer for 3bn euros in a move that made it the largest shareholder. Initially, Porsche's share price plunged as investors were spooked by the acquisition. "It might have surprised some people when a small, independent sports car manufacturer became the largest shareholder in Europe's largest car company," says Mr Baumann. 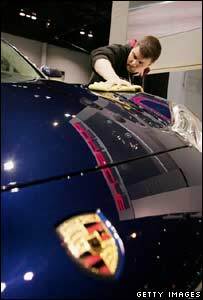 But the stock has since recovered, and last week the investment bank Morgan Stanley raised its earnings estimate for Porsche - largely because it expects Volkswagen Group figures to be included in Porsche's own earnings reports in the future. Porsche says it will decide whether or not to do so by the end of the fiscal year in July. Porsche's stake in Volkswagen is not a clear-cut affair, however. In particular, the role of Ferdinand Piech, chairman of Volkswagen's supervisory board, is muddying the waters. Mr Piech is also the grandchild of Ferdinand Porsche who founded the sports car maker and whose family still controls the firm. It was Porsche chief Wendelin Wiedeking's idea to buy into VW, Mr Baumann says, in order to "secure the independence of our company". Mr Wiedeking has gained a seat on the Praesidium, the inner circle of Volkswagen's supervisory board, and his chief financial officer Holger Haerter is set to join the board on 3 May. This is exactly the way Porsche, and presumably Mr Piech, want things to be, though they have met resistance from Volkswagen's other major stakeholder, the German state of Lower Saxony, which fears Mr Piech is too powerful. His actual powers are to be put to the test on 3 May, when the futures of both Mr Piech and Volkswagen Group chief executive Bernd Pischetsrieder will be decided. A power battle is brewing where the worker representatives on the supervisory board want to oust Mr Pischetsrieder, while Volkswagen's shareholders - who are represented by Mr Piech - want to keep him. In an interview with The Wall Street Journal this week, Mr Piech has acknowledged that he may not be powerful enough to save Mr Pischetsrieder's skin.